Jose Arguelles, who organized the 1987 Harmonic Convergence, was also the co-founder of Earth Day and founder of the first Whole Earth Festival, which was held in Davis, California, in 1970. There many other vortex sites around the world. They include Crater Lake in Washington State; the Giza Plateau in Egypt, site of the Great Pyramids; Uluru (Ayers Rock) in the Outback of Australia; Stonehenge in England; the Inca ruins of Machu Picchu in Peru; and mysterious Easter Island in the Pacific. Built into one of the beautiful sandstone formations near Sedona is the Chapel of the Holy Cross, a Roman Catholic chapel on Coconino National Forest land. The special-use permit for the construction was obtained with the help of Arizona Senator Barry Goldwater in the 1950s. 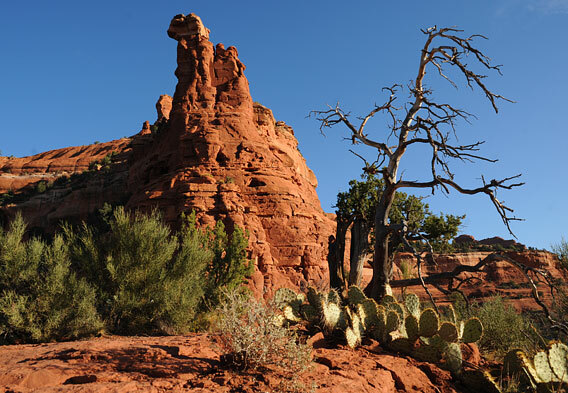 The Sedona area has appeared in numerous films, which earned the town the nickname of "Arizona's Little Hollywood." The first films shot here were from the silent era: Zane Grey's The Call of the Canyon and Kit Carson. John Ford pulled into town with a young John Wayne for the production of the classic Stagecoach in 1938, and many films have been shot here since. The town of Sedona Arizona is set in the Verde Valley about 150 miles north of Phoenix and in the midst of beautiful red sandstone formations in imaginative and impressive shapes. It is this spectacular scenery and the many outdoor activities-especially hiking-around them that draw visitors from around the world. Beginning in the 1960s, artists and artisans began arriving in the town, which today has numerous artist workshops, handcraft boutiques, and art galleries. More and more "New Age" and spiritual types also came, and today the town is full of health spas, meditation retreats, yoga instructors, palm and tarot readers, crystal and Reiki healers, vegetarian restaurants, and similar establishments. Since at least the time of the Anasazi, the Ancient Pueblo People, this awe-inspiring region has had spiritual significance. One aspect of the New Age era is the belief that vortexes (vortices) in four of the sandstone formations emit a healing power and energy. (A vortex is the funnel shape produced by whirling fluid or energy, from a tornado to a whirlpool to the water swirling down the kitchen sink.) The Harmonic Convergence, organized by New Age artist Jose Arguelles, was held August 16 and 17, 1987, and Sedona was one of the global centers for the event. 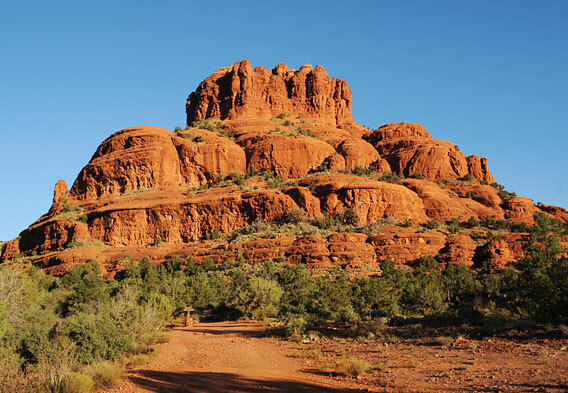 The four main vortexes in Sedona are Airport, Bell Rock, Boynton Canyon, and Cathedral Rock, each of which is said to emit a masculine, feminine, or balanced energy. There are hiking trails to all them, which you can do on your own. There are maps available in town, and the vortex spots are marked by cairns. 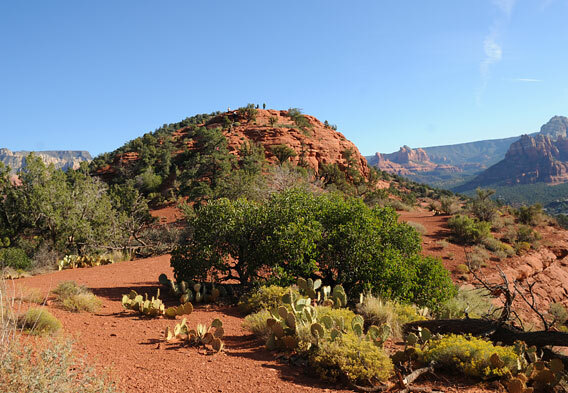 There are also guided hikes and tours around the Sedona vortexes. The Cathedral Rock Vortex (pictured) is one of the most beautiful and famous of the sandstone formations around Sedona. Its name comes from its several spires reaching to the sky like a majestic cathedral. It is said to be one of the strongest of the four vortexes and to emit a calming and balanced feminine energy. The first part of the hike to the vortex spot is fairly strenuous, so there are fewer tourists on the trail than at the other vortexes around the city. This formation, as its name suggests, resembles a giant bell with the tapered end at the top. This makes it easily recognizable, and the parking areas and trails are well-marked. The rock is noted for the many whimsically twisted juniper trees, which believers say is the result of the strength of the energy emanating from its vortex. The energy from Bell Rock is considered to be a more active masculine force. There is a loop trail around the formation that can be managed by most people quite easily. Boynton Canyon is a beautiful box canyon with wonderful landscapes and scenery, making it a worthwhile hike whether or not you subscribe to the vortex beliefs. This vortex is said to emit both masculine and feminine energy, also referred to as balancing energy, which makes it unique among the four main vortices. It is a moderately difficult hike along a loop trail that stretches for five miles. More twisted junipers line this trail, which provide for a lovely view en route to the vortex itself. The vortex is located on a mini mesa atop the larger mesa, and it is said to emit a masculine energy. The loop trail at this location is about 3.5 miles in length, and the hike to the summit of the mesa can be done fairly quickly. There is a small airport (hence the name), a small hotel, and a handful of restaurants at the top. Time your visit to be able to view the wonderful sunsets from this viewpoint-it's one of the best sunset vistas in the Sedona area.